After a 12 hour day of baking, I'm exhausted! What a mess my kitchen was, and I'm a clean as I go cook! After two hours of cleaning, this is what my kitchen now looks like! I tried two different zucchini bread recipes. This one is from King Arthur Flour and is called Whole Wheat Zucchini Nut Bread. It's quite dark and that's due to my using molasses as oppose to honey. They gave me a choice and I went for black strap molasses, which is high in iron! The bread is good and certainly healthy! I like this recipe but not DD. Another bread recipe is from the website Family Food and Travel and is called The Best Chocolate Chip Zucchini Bread. This has become a favourite with DD! I modified the recipe and added 1/2 cup of chopped walnut.... gotta love that food processor! I have made several batches of this bread and plan on freezing it. Of course I will send some home with whom ever comes to visit me! ;o) Let's not forget the muffins too! Would you be surprised if I told you that I am stuffed from tasting all of these various recipes? I need a zucchini break! Found this autumn leaf on the ground at Upper Canada Village in Morrisburg, Ontario, Canada ..... gasp .... so soon? Have you ever been to Upper Canada Village? It's a wonderful place to visit, that is if you like to go back in time to the year 1860. That's where dd and I spent the day, just wondering around .... looking for photographing opportunities. It was a perfect day to stroll along the St Lawrence Sea Way. Allow me to take you on a tour. Here is Bellamy's Steam Flour Mill. 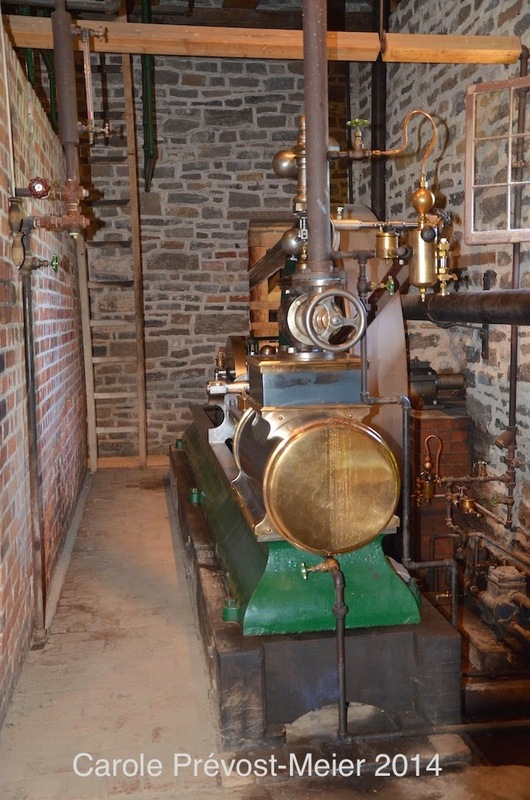 It was water turbine powered for the longest time, but with recent water issues, a new steam engine was added. These old types of machinery just fascinate me to no end! That was an extremely expensive piece of equipment in the 1860. It's a beauty alright. 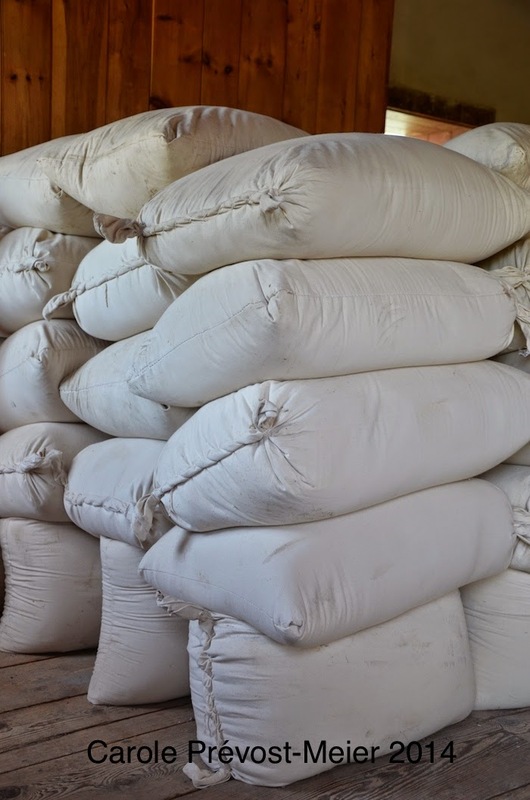 They stone ground the grains and produce flour, which can be purchased at the gift shop. 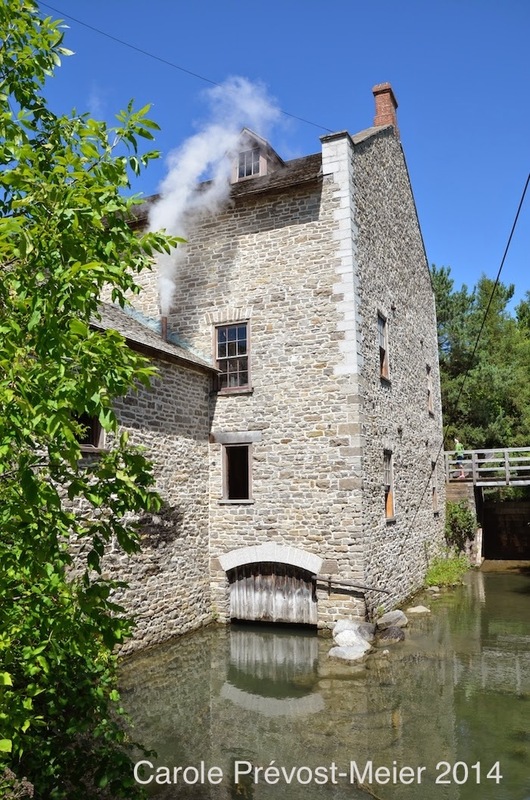 Because the stone ground flour from this mill has not been altered in any way, is it quite different to bake with than your grocery store variety. It is heavier and thus produces denser breads or cakes. I love this flour and always make a point to purchase a 10 pound bag. The ones you see are 50 pounds and a bit much for me. They do use the flour in their restaurants for bake goods as well as sell it to high end restaurants in Toronto. Lots of places to see in the village ... the tin smith for one! DD and I had a wonderful day, just shooting artsy photos! The weather was perfect! We left Upper Canada Village and headed for Sainte Anne de Bellevue, Quebec, where we dinned by the boat locks! What a view! What a great day! Thanks for stopping by! Cheers!